A digital manga remake of the series, illustrated by Yusuke Murata, began publication on Shueisha's Young Jump Web Comics website in 2012. The chapters are periodically collected and printed into tankōbon volumes, with nineteen volumes released as of April 4, 2019. Viz Media has licensed the remake for English serialization in its Weekly Shonen Jump digital magazine. An anime television adaptation by Madhouse aired in Japan between October and December 2015. It was dubbed in English during the summer of 2016, and later that year a planned second season was announced. On September 25, 2017, it was announced that they would be changing both its production company and director. The second season premiered in April 2019. On an unnamed Earth-like super-continent planet, powerful monsters and villains have been mysteriously appearing and causing disasters. To combat them, the world's government created a Hero Association that employs superheroes to stop the violent creatures and villains. Each of the Hero Association's superheroes are ranked from Class-C to Class-S. Saitama is an unranked hero, hailing from the metropolis of City-Z, who performs heroic deeds for his own entertainment. He has trained himself to the point where he can effortlessly defeat any opponent with a single punch. However, since Saitama became a hero for the fun of the experience, he has lately become bored with his superhuman power, and frustrated at the complete lack of strong opponents that can challenge him. It is confirmed that Saitama could destroy a solar system if he used a super-serious punch at full power. Over the course of the series, Saitama encounters various superheroes, friends, villains, and monsters. He quickly gains a pupil, the cyborg Genos, who is on a revenge quest to find another cyborg that slaughtered his entire family and hometown. Eventually the two join the Hero Association in order to gain official recognition. Genos proves to be a prodigy and is instantly placed in Class-S, while Saitama barely passes the written test and is therefore placed in Class-C, making him the lowest ranked hero. Saitama performs many feats that go mostly unnoticed and unappreciated by the public, such as defeating the ninja Speed o’ Sound Sonic and destroying an incoming meteor that was going to obliterate City-Z. Saitama is promoted to Class-B after he defeats the powerful Deep Sea King, who rains destruction on City-J. Monsters begin to appear in City-Z, searching for a mysterious Monster Association. Soon after, the great seer Shibabawa has a vision that the world is in danger. Panicking, the Hero Association calls all S-Class heroes to a meeting, begging them to protect the world. Immediately after the meeting, the leader of the Dark Matter Thieves, Boros, invades the planet and destroys City-A. Saitama duels with Boros and defeats him by using a serious punch. During the invasion of aliens, the S-Class hero, Drive Knight, warns Genos that the S-Class hero, Metal Knight, is his enemy. The Hero Association salvages City-A with the help of Metal Knight, and they build a new base of operations that will allow the Hero Association to deploy heroes more easily. Saitama begins to gradually know other superheroes. He quickly becomes friends with the old martial arts master, Bang, and the "most powerful" superhero named, King, who is actually a cowardly nonviolent otaku who got his S-Class position by accidentally receiving credit for many of Saitama's previous victories. When the Hero Association executive Sitch tries to recruit villains to become superheroes, Bang's former apprentice, Garo, emerges and starts beating down many of the other heroes, prompting the association to make a small effort to stop him. In order to learn more about martial arts, Saitama enters a tournament in disguise. During the martial arts tournament, the Monster Association leads an all-out attack on multiple cities causing massive panic and damage. The Hero Association struggles to keep up with the attacks. Genos fights monsters and protects the tournament so that Saitama can safely compete. Despite being the most powerful hero in the world, Saitama automatically loses the tournament due to being caught wearing a wig and impersonating another martial artist, Charanko. Saitama flees the tournament in fear of being arrested by the police. During the award ceremony, the powerful monster, Gouketsu, lays siege on the tournament after defeating Genos in combat. Gouketsu presents monster cells that can turn humans into monsters after being ingested to the people of the stadium, telling them that he'll kill them if they don't ingest the cells. Some people partake of the cells becoming monsters, including the martial artist, Bakuzan. Saitama returns to the stadium after hearing explosions and the winner of the tournament, Suiryu's desperate cries for help. Saitama defeats Gouketsu and Bakuzan before they can slaughter innocent people. Saitama humbles Suiryu and inspires the cocky martial artist to become a hero. The B-Class hero, Fubuki, tries to have Saitama join her faction of heroes. Garo, determined to become the most powerful monster, continues to grow stronger and stronger and hunts more heroes down including S-Class heroes, Tank-Top Master and Metal Bat. The Hero Association ranks him at a threat of "Dragon" level, the second highest that is possible. They fail to capture him after sending a team of A-Class heroes to stop him. Bang confronts Garo and almost kills him, but the Monster Association rescues him at the last second to try and recruit him. The Monsters continue to attack people and continue to gather in City-Z, being led by the powerful psychic, Gyoro Gyoro, and the monster king, Orochi. Garo refuses to join the Monster Association and continues to defeat heroes. Meanwhile, the Hero Association leads an all out war against the Monster Association with hundreds of heroes, after the monsters kidnap the child of a high ranking contributor to the Hero Association. A new association known as, The Organization, consisting of powerful robots, allies itself with the Monster Association by sending robots such as G5 to help in the war. One-Punch Man began publication in 2009 when One became interested in creating a comic super hero that was already the strongest in the world. One had wanted to focus on different aspects of storytelling than standard super hero stories normally rely on, such as every day problems. One said, "Punching is oftentimes pretty useless against life's problems. But inside One Punch Man's universe, I made Saitama a sort of guy who was capable of adapting his life to the world that surrounded him, only armed with his immense power. The only obstacles he faces are mundane things, like running short of money." One self published the series on the website Nitosha, a Japanese site for publishing online manga. The series was an instant success online, where One generated thousands of viewers and comments within weeks. According to One, the series really began to take off by the time he had written the fifth chapter. On Nitosha, a series was considered popular if it consistently received at least 30 comments, but by the time One had published chapter 30, he was receiving nearly a thousand comments per chapter. In February 2010, One put the series on hiatus in order to focus on work for his family. When One returned to drawing manga in 2011, he was contacted by Yusuke Murata about a possible partnership, where Murata would redraw the manga for One. Murata had been an enormous fan of One-Punch Man, and was ill at the time. Fearing that he was going to die, he contacted One. Reflecting back he said, "Around that time, I was actually really sick. I broke out in hives, my inner organs were infected, and I couldn't breathe well with my windpipes swelling. I was in the hospital when I thought, "Ah, I guess people die just like that." If I'm going to die, I want to do something I really love to do. I want to draw manga with Mr. ONE. That's what I thought." Murata, an already successful manga artist, used his connections in the industry to get a publishing deal with Weekly Young Jump comics. One began publishing One-Punch Man as a webcomic in 2009. As of April 2019[update], the webcomic has released 111 chapters. When the series became popular, receiving 7.9 million hits by June 2012, Yusuke Murata contacted One with a proposal to redraw the comic for digital publication in Weekly Young Jump's spin-off manga website Young Jump Web Comics (となりのヤングジャンプ, Tonari no Yangu Janpu), published by Shueisha. The first chapter was published on June 14, 2012. The chapters are periodically collected and printed into tankōbon volumes, with eighteen volumes released as of December 4, 2018. A drama CD was bundled with the ninth volume, which was released in August 2015. The series began publication in Viz Media's Weekly Shonen Jump (Shonen Jump Alpha at the time) in North America on January 21, 2013. The first digital volume was released in February 2014. 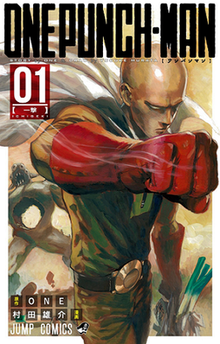 One-Punch Man was one of a number of series that Viz made available on ComiXology in June 2014. The manga was released in print in the United States starting in September 2015. An anime adaptation was announced in the 15th issue of Weekly Young Jump on March 10, 2015. The series' first season was directed by Shingo Natsume at Madhouse and written by Tomohiro Suzuki. The series also features character designs by Chikashi Kubota, who also serves as chief animation director, music by Makoto Miyazaki and art design by Shigemi Ikeda and Yukiko Maruyama. Ken Hashimoto serves as the series color key artist, Akane Fushihara is the director of photography and Kashiko Kimura serves as the series editor, and Shoji Hata does sound design. The opening theme song is "The Hero!! ~Ikareru Ken ni Honō o Tsukero~" (THE HERO!! ～怒れる拳に火をつけろ～, "The Hero!! Set Fire to the Furious Fist") by JAM Project, and the closing theme is "Hoshi Yori Saki ni Mitsukete Ageru" (星より先に見つけてあげる, "I'll Find It Before the Stars for You") by Hiroko Moriguchi. One-Punch Man's first season aired in Japan between October 5, 2015 and December 21, 2015 on TV Tokyo, airing at later dates on TVO, TVQ, KBS, BS Japan, and AT-X, and ran for 12 episodes. The season streamed on Niconico and was simulcast on Hulu, Daisuki, and Viz Media's Neon Alley service. A preview screening of the first two episodes was held in the Saitama City Cultural Center on September 6, 2015. The series is licensed by Viz Media in North America, Latin America, and Oceania, and by Viz Media Europe in Europe, the Middle East, and Africa. Kaze UK and Manga Entertainment handle the distribution of the series in the United Kingdom, and Madman Entertainment handles distribution in Australia and New Zealand, who also simulcasted the series on AnimeLab. An original video animation was released with the tenth manga volume on December 4, 2015. Additional OVA episodes are included with Blu-ray Disc & DVD volumes of the season, the first of which was released on December 24, 2015. Murata announced in the last weeks of the first season's airing schedule that he was working on making a second season a reality, but had not confirmed it was in development as of December 2015[update]. Viz Media announced that they were working on an English-language dub of One-Punch Man at Anime Boston 2016. On July 1 of the same year, it was announced during Toonami's Anime Expo panel that the series would begin airing on July 16, 2016. A second season was later confirmed in September 2016 and is currently in production. The second season is animated by J.C. Staff with Chikara Sakurai replacing Shingo Natsume as director and Yoshikazu Iwanami replacing Shoji Hata as sound director. Tomohiro Suzuki, Chikashi Kubota and Makoto Miyazaki reprised their roles as series composer, character designer and music composer, respectively. The opening theme song is "Uncrowned Greatest Hero" (静寂のアポストル, Seijaku no Apostle, lit. "Quiet Apostle") by JAM Project, and the closing theme is "Chizu ga Nakutemo Modoru kara" (地図が無くても戻るから, lit. "Even Without a Map, I'll Return") by Makoto Furukawa. On March 4, 2019, it was announced that the second season would premiere on April 9, 2019, while a television special aired on April 2, 2019. The second season is simulcast on Hulu in the US, on Tubi in Canada, on AnimeLab in Australia and New Zealand, and on Crunchyroll in Europe. A 10-minute OVA will be bundled with the second season's first Blu-ray Disc/DVD volume on August 27, 2019. One-Punch Man had 2.2 million copies in print in November 2013, 3.2 million copies in April 2014, and 4.5 million copies in November 2014. By November 2016, this number had grown to 11.1 million copies in print. The series was one of ten nominated for the seventh annual Manga Taishō Awards in 2014. As of July 2017, the manga had 13 million copies in print. As of December 2018, the manga had 16.5 million copies in print. ^ "One-Punch Man TV Anime Promo Video Previews Story". Anime News Network. March 23, 2015. Archived from the original on September 23, 2015. Retrieved September 22, 2015. ^ "The Official Website for One-Punch Man". Viz Media. Archived from the original on November 10, 2017. Retrieved October 29, 2017. ^ a b Silverman, Rebecca (September 22, 2015). "One-Punch Man GN 1 & 2". Anime News Network. Archived from the original on September 23, 2015. Retrieved September 22, 2015. ^ "Animax Asia to Air One-Punch Man, Nisekoi Anime". Anime News Network. March 14, 2016. Archived from the original on October 31, 2016. Retrieved August 17, 2016. ^ "Two Creators of the Original Manga One-Punch Man". Oppai Hoodie Blog. Archived from the original on August 5, 2017. Retrieved May 20, 2017. ^ a b c d Chapman, Paul (March 7, 2015). ""One-Punch Man" Anime Greenlit". Crunchyroll. Archived from the original on September 23, 2015. Retrieved September 19, 2015. ^ a b c "Young Jump Launches Free Site with Eyeshield 21's Murata (Updated)". Anime News Network. June 13, 2012. Archived from the original on September 24, 2015. Retrieved September 19, 2015. ^ a b Brown, Urian (September 9, 2015). "One-Punch Man Vols. 1–2". Weekly Shone Jump. Viz Media. Archived from the original on September 14, 2015. Retrieved September 19, 2015. ^ "weblio実用日本語表現辞典" [Weblio Practical Japanese Expression Dictionary] (in Japanese). Archived from the original on November 9, 2016. Retrieved May 14, 2016. ^ a b "Viz's Shonen Jump Alpha Adds One-Punch Man Manga". Anime News Network. January 14, 2013. Archived from the original on December 26, 2014. Retrieved January 19, 2015. ^ a b "One-Punch Man Manga Gets TV Anime". Anime News Network. March 7, 2015. Archived from the original on September 19, 2015. Retrieved September 19, 2015. ^ "One-Punch Man TV Anime Listed for October Premiere". Anime News Network. March 17, 2015. Archived from the original on September 23, 2015. Retrieved September 19, 2015. ^ "One-Punch Man Anime's October Premiere Confirmed". Anime News Network. July 22, 2015. Archived from the original on September 5, 2015. Retrieved September 19, 2015. ^ a b "One-Punch Man TV Anime Gets 2nd Season, Game App". Anime News Network. September 25, 2016. Archived from the original on September 26, 2016. Retrieved September 25, 2016. ^ "'One Punch Man' Announces Controversial Changes To Season 2". Anime. Archived from the original on September 26, 2017. Retrieved September 26, 2017. ^ a b Valdez, Nick. "'One Punch Man' Creator Reveals How He Created Saitama". ComicBook.com. Archived from the original on October 26, 2018. Retrieved October 25, 2018. ^ "The untold truth of One-Punch Man". Archived from the original on October 26, 2018. Retrieved October 25, 2018. ^ a b "WEB漫画が拓く未来 Vol.2「『ワンパンマン』作者.ONEインタビュー」『ワンパンマン』誕生秘話" (in Japanese). Archived from the original on August 30, 2017. Retrieved October 25, 2018. ^ "WEB漫画が拓く未来 Vol.2「『ワンパンマン』作者.ONEインタビュー」2「『ワンパンマン』作者.ONEインタビュー」" (in Japanese). Archived from the original on February 1, 2018. Retrieved October 25, 2018. ^ a b c Peters, Megan (November 14, 2017). "'One Punch Man' Illustrator Shares The Manga's Touching Inspiration". ComicBook.com. Archived from the original on October 26, 2018. Retrieved October 25, 2018. ^ "One-Punch Man Web Manga Returns with New Chapter after Two Year Hiatus". Gojinshi. April 12, 2019. Retrieved April 13, 2019. ^ "Yūichi Nakamura, Takahiro Sakurai, 3 More Join One-Punch Man Anime Cast". Anime News Network. June 24, 2015. Archived from the original on September 21, 2015. Retrieved September 19, 2015. ^ "MANGA: One-Punch Man Vol. 1". Weekly Shonen Jump. Viz Media. February 18, 2014. Archived from the original on October 1, 2015. Retrieved September 19, 2015. ^ "Viz Media Adds 500 Manga Volumes on ComiXology". Anime News Network. June 11, 2014. Archived from the original on September 16, 2015. Retrieved September 19, 2015. ^ "One-Punch Man to Debut in Print in N. America". Anime News Network. June 5, 2015. Archived from the original on September 9, 2015. Retrieved September 19, 2015. ^ "One-Punch Man Anime Features Kaito Ishikawa, Makoto Furukawa, Madhouse". Anime News Network. March 20, 2015. Archived from the original on September 15, 2015. Retrieved September 19, 2015. ^ a b c d "One-Punch Man Anime's 3rd Video Unveils More of Cast, JAM Project Song, Debut Date". Anime News Network. September 6, 2015. Archived from the original on September 23, 2015. Retrieved September 19, 2015. ^ "On Air". One-Punch Man (in Japanese). Archived from the original on October 1, 2015. Retrieved October 1, 2015. ^ a b "One-Punch Man TV Anime Casts Saori Hayami, Mamoru Miyano". Anime News Network. August 5, 2015. Archived from the original on September 23, 2015. Retrieved September 19, 2015. ^ "TVアニメ『ワンパンマン』先行上映会を開催しました！". One Punch Man (in Japanese). September 7, 2015. Archived from the original on August 12, 2016. Retrieved June 5, 2018. ^ "Viz Adds Legend of Galactic Heroes Novels, One-Punch Man Anime (Updated)". Anime News Network. July 2, 2015. Archived from the original on September 21, 2015. Retrieved September 19, 2015. ^ a b Anime Consortium Japan; Viz Media; Viz Media Europe (July 5, 2015). "Viz Media, Viz Media Europe and Anime Consortium Japan Announce Acquistion of Multi-Territory Media Rights to One-Punch Man Anime Series". Anime News Network. Retrieved February 17, 2019. ^ "Manga Entertainment and Animatsu News From London Comic Con". Anime News Network. October 23, 2015. Archived from the original on October 28, 2015. Retrieved October 28, 2015. ^ "AnimeLab adds Heavy Object, One-Punch Man and Yuruyuri San Hai! to Fall Simulcast Season". Anime News Network. October 8, 2015. Archived from the original on November 7, 2017. Retrieved November 5, 2017. ^ "One-Punch Man Manga's 10th Volume Listed With OVA". Anime News Network. September 24, 2015. Archived from the original on September 25, 2015. Retrieved September 24, 2015. ^ "1st One-Punch Man BD/DVD to Include 'OVA #01'". Anime News Network. October 5, 2015. Archived from the original on October 5, 2015. Retrieved October 5, 2015. ^ "One-Punch Man Anime's 2nd BD/DVD Release Includes OVA". Anime News Network. November 14, 2015. Archived from the original on November 15, 2015. Retrieved November 14, 2015. ^ "One-Punch Man Anime DVD/BDs to Include 6 OVAs". Anime News Network. November 15, 2015. Archived from the original on November 16, 2015. Retrieved November 15, 2015. ^ Cayetano, Byron. "'One-Punch Man' Season 2 Confirmed? Remake Creator Yusuke Murata Hard at Work To Make It Happen". KpopStarz. Archived from the original on December 22, 2015. Retrieved December 30, 2015. ^ "Viz Media Working on One Punch Man English Dub". Anime Corner. March 28, 2016. Archived from the original on April 4, 2016. Retrieved March 28, 2016. ^ "Chikara Sakura Directs One-Punch Man Anime's 2nd Season at J.C. Staff". Anime News Network. September 25, 2017. Archived from the original on September 26, 2017. Retrieved September 25, 2017. ^ "One-Punch Man Anime's 2nd Season Reveals More Cast, Opening Song Performers". Anime News Network. January 26, 2019. Retrieved January 26, 2019. ^ a b c "One-Punch Man Season 2 Airs April 2 Special Before April 9 Hulu Premiere". Anime News Network. March 4, 2019. Retrieved March 4, 2019. ^ VIZ [@VIZMedia] (March 18, 2019). "Time to see your favorite #OnePunchMan heroes and villains in action! Season 2 premieres April 9 on @Hulu! The countdown starts now!" (Tweet). Retrieved April 20, 2019 – via Twitter. ^ "One-Punch Man Anime Season 2 Unveils Teaser, JAM Project's Return, April Premiere". Anime News Network. August 12, 2018. Archived from the original on August 12, 2018. Retrieved August 12, 2018. ^ Hodgkins, Crystalyn (April 18, 2019). "Tubi TV Streams One-Punch Man Anime, 3 Naruto Films in Canada". Anime News Network. Retrieved April 20, 2019. ^ AnimeLab [@AnimeLab] (March 5, 2019). "SAITAMA IS BACK with a striking new visual and a premiere date of April 9, 2019! 👊💥 One-Punch Man Season 2 will also be streaming EXCLUSIVELY on AnimeLab each week in AUS & NZ! 🎊" (Tweet). Retrieved April 13, 2019 – via Twitter. ^ Sherman, Jennifer (April 9, 2019). "Crunchyroll Streams One-Punch Man Season 2 Anime in Europe". Anime News Network. Retrieved April 13, 2019. ^ "One-Punch Man Season 2 Gets Original Video Anime". Anime News Network. April 10, 2019. Retrieved April 10, 2019. ^ "One-Punch Man Has 2.2 Million Copies in Print (Updated)". Anime News Network. November 22, 2013. Archived from the original on September 24, 2015. Retrieved September 22, 2015. ^ "One-Punch Man Has 3.2 Million Copies in Print". Anime News Network. April 20, 2014. Archived from the original on September 25, 2015. Retrieved September 22, 2015. ^ "One-Punch Man Manga Has 4.5 Million Copies in Circulation". Anime News Network. November 23, 2014. Archived from the original on September 24, 2015. Retrieved September 22, 2015. ^ "One-Punch Man Manga Has 11.11 Million Copies in Print". Anime News Network. November 23, 2016. Archived from the original on December 13, 2016. Retrieved January 6, 2017. ^ "10 Titles Nominated for 7th Manga Taisho Awards". Anime News Network. January 20, 2014. Archived from the original on September 24, 2015. Retrieved September 22, 2015. ^ "One-Punch Man Manga Has 13 Million Copies in Print". Anime News Network. July 25, 2018. Archived from the original on July 30, 2017. Retrieved August 7, 2017. ^ "Roundup of Newly Revealed Print Counts for Manga, Light Novel Series - December 2018". Anime News Network. January 2, 2019. Retrieved April 4, 2019. ^ a b c * "Best Sellers – Manga". The New York Times. September 20, 2015. Archived from the original on September 17, 2015. Retrieved September 21, 2015. "Best Sellers – Manga". The New York Times. September 27, 2015. Archived from the original on September 26, 2015. Retrieved September 21, 2015. "Best Sellers – Manga". The New York Times. October 4, 2015. Archived from the original on September 28, 2015. Retrieved September 27, 2015. "Best Sellers – Manga". The New York Times. October 11, 2015. Archived from the original on October 11, 2015. Retrieved October 5, 2015. ^ "All You Need Is Kill, In Clothes Called Fat, Master Keaton, One-Punch Man, Mizuki's Showa, Wolf Children Nominated for Eisner Awards". Anime News Network. April 22, 2015. Archived from the original on September 24, 2015. Retrieved September 22, 2015. Wikimedia Commons has media related to One Punch-Man.